(New York, SANA, Reem/H. Said) ~ Syria’s Permanent Representative to the UN Bashar al-Jaafari asserted that the report issued by the United Nations and the Organization for the Prohibition of Chemical Weapons (OPCW) on the chemical attacks in Syria lacks physical evidence on using chlorine in the two cases referred to in the report. Addressing a press conference after a closed-session of the UN Security Council on Tuesday to discuss the third report of the Joint Investigative Mechanism (JIM), al-Jaafari said the report’s conclusions are not convincing as they are based on accounts by witnesses affiliated to the armed terrorist groups. He underscored that there was not any material evidence in any of the report’s paragraphs, whether samples or medical reports which prove that chorine was used. Nevertheless, the Syrian government will continue to cooperate with the Joint Investigative Mechanism to reach irrefutable evidence and will continue its own investigations because “Syria has a main interest in reaching the truth, and not assumptions built on the manipulation and exploitation of these incidents to achieve political interests,” said al-Jaafari. Asked on whether Syria sees in the new report renewed pressure to return to the “red line” scenario, al-Jaafari made it clear that “this file has been ambiguous and disputable from the beginning” where many governments that are hostile to Syria fished in troubled waters regarding this file, in particular the American administration, only to later appear that it was inaccurate being based on false and baseless information. The Syrian ambassador pointed out that the influential countries in the Security Council knew the parties who used chemical weapons in the incident of Khan al-Assal in Aleppo and kept them quite unidentified, therefore the talks between the Syrian side and the UN Secretary General continued for four months and 11 days until the chief of the UN chemical weapons inspectors Ake Sellstrom and his team were sent to Syria to investigate the chemical attack. Shortly afterwards, al-Jaafari stated, an article written by the American journalist Seymour Hersh emerged accusing the governments of some foreign countries of being behind delivering toxic gases to the terrorists in Syria. “Now we have a letter accusing the former French Foreign Minister Laurent Fabius of being involved in Kan al-Assal incident and in the Eastern Ghouta incident,” he said. Al-Jaafari also referred to current reports that a Syrian terrorist called Haitham Qassab, who works for the Turkish intelligence, was arrested while he was transporting two liters of Sarin from Libya to Turkey onboard a civilian plane as it would be tested on rabbits at a laboratory in Gaziantep before being transported to Syria where it would be used against the civilians to accuse the Syrian government. He went on saying that since JIM started its work in Syria, he has sent 17 complaints to the members of the Security Council on the use of toxic gases in 17 cases, adding that each time he received unconvincing answers. “The Mechanism couldn’t deal with these cases because it is out of its mandate,” he said. (Washington, SANA, R.J/H. Said) ~ The findings of the latest joint report of the UN and the Organization for the Prohibition of Chemical Weapons (OPCW) that blamed Damascus for several chemical attacks lack specifics, Russia’s Permanent Representative to the UN Vitaly Churkin asserted. 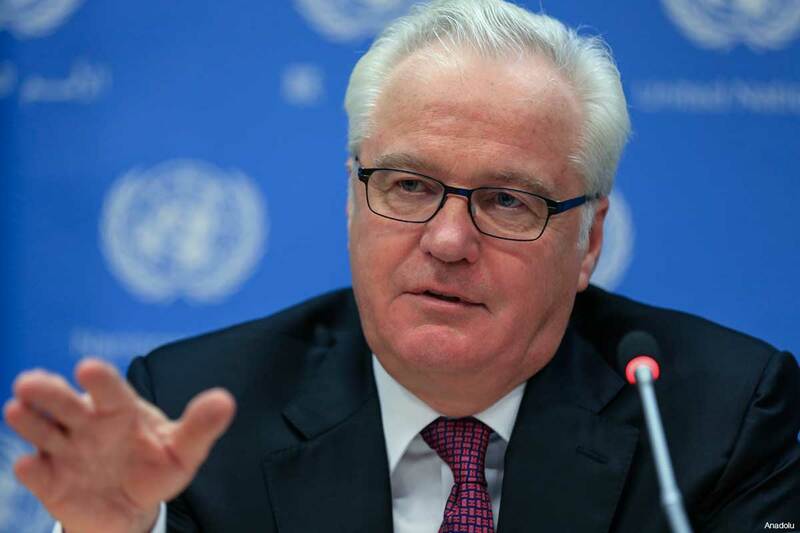 Churkin’s remarks came in response to a question on whether there is sufficient evidence in the report to impose sanctions on Damascus, following a closed-door session of the UN Security Council on Tuesday. He told reporters that there are a number of questions which have to be clarified before Russia will accept all the findings and conclusions of the report.